ST. PETERSBURG, Fla. (AP) — The Tampa Bay bullpen gave the struggling Rays a much-needed lift. Relievers Brandon Gomes, Alex Colome and Brad Boxberger combined for 4 2-3 scoreless innings and the Rays ended Minnesota’s six-game winning streak, beating the Twins 5-4 on Thursday night. The loss dropped the Twins a half-game behind Texas for the second AL wild-card spot. Tampa Bay, which won for the fifth time in 13 games, is 2 1-2 games back of the Rangers. "We needed that one," Rays manager Kevin Cash said. "The bullpen was just outstanding. Really came in and gave us a big boost." Gomes (2-4) got an inning-ending double play with two on in the fifth during his 1 2-3 innings. After Colome worked two innings, Boxberger struck out all three batters he faced for his 31st save. The trio allowed just Brian Dozier’s infield single in the seventh. 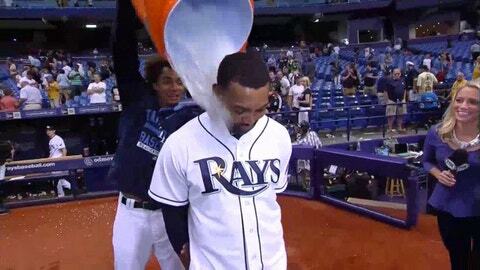 Joey Butler, recalled from Triple-A Durham to take the place of injured outfielder Desmond Jennings, had an RBI single off Tommy Milone (6-4) and later scored on a passed ball to give Tampa Bay a 5-4 lead in the sixth. "It was fun to be back out there with the guys playing for a playoff spot," Butler said. Eduardo Escobar homered for the Twins, who were looking for their longest road winning streak since 2006. All six wins had come away from Target Field. "You try to get greedy," Twins manager Paul Molitor said. "You try to get wins when you’re rolling and keep the momentum going. Hopefully we’ll look at the bigger picture of how we put together a nice little run, but in the moment you’re a little disappointed you couldn’t find a way to finish it off." Minnesota went 6-4 on a 10-game trip. Milone allowed five runs and eight hits in 5 1-3 innings. In his previous outing Sunday, he helped out a depleted bullpen and got his first professional save as the Twins beat Baltimore 4-3 in 12 innings. Escobar had a solo homer off Drew Smyly during a two-run fourth that put the Twins ahead 4-2. On Wednesday, Escobar hit a pair of solo shots for his first multihomer game. "Escobar, we’re glad he’s getting out of town," Cash said. Smyly gave up four runs and eight hits over 4 1-3 innings in his third start since returning from a left shoulder injury that sidelined him three months. The left-hander threw 100 pitches. J.P. Arencibia cut the Rays’ deficit to 4-3 with a sacrifice fly in the fifth. After Kurt Suzuki drove in a run on his 200th career double during the second, the Twins tied it at 2 when Miguel Sano had a towering RBI double to center field in the third that struck an overhanging catwalk around 150 feet above the playing surface. The Rays scored twice in the first on Evan Longoria’s sacrifice fly and a solo homer by Logan Forsythe. "He did a lot better today," Molitor said. "We didn’t push him, but there’s a lot of optimism he should be ready to go." Rays: Jennings went on the 15-day DL due to a bruised left knee. "Our thought was let’s see if 15 days of rest can help," Cash said. Jennings missed 96 games earlier this season with bursitis in the same knee. Escobar became the first Twins SS with at least three homers in a three-game series since Roy Smalley in August 1978 at Seattle. … He has a career-high eight homers this season, including four in his last 21 at-bats. Twins: RHP Kyle Gibson (8-9) starts the opener of a six-game homestand Friday against LHP Scott Kazmir (7-8) and the AL West-leading Houston Astros. Minnesota is 38-24 at home this season. Rays: RHP Erasmo Ramirez (10-4) will face RHP Edinson Volquez (11-7) and the AL Central-leading Kansas City Royals Friday night. Tampa Bay is 5-18, including 0-4 this season, over the past four years against the Royals.